I was introduced to the work of OCCM Golf on my trip this past fall to Melbourne, Australia. The Australian golf course design firm is made up of Geoff Ogilvy, Michael Clayton, Mike Cocking, and Ashley Mead, and on that trip, I was able to play Victoria Golf Club with a group of friends that included Michael Clayton. 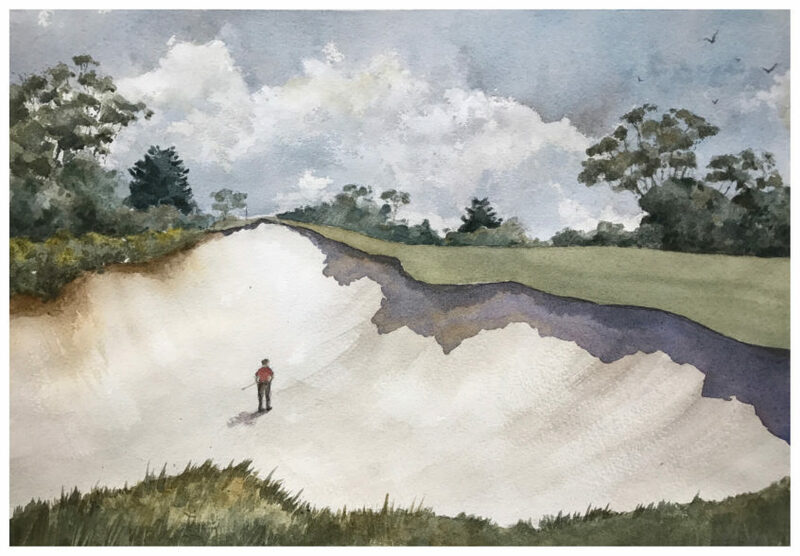 One thing led to another, and I began following Mike Cocking on social media, where I began to notice his sketches and beautiful watercolor paintings of golf courses. I shot Mike a quick email asking if he’d be up for an interview on the site, and the resulting article has made for one of my favorites in the Golf Art Section! I love that Mike was happy to share everything from his sketches to even a few hole outlines that he marked in dirt. OCCM is already very well known in Australia, but watch for them in the US. They were recentlyfeatured in LINKS Magazine for their first US design work in Texas. Count my words, you’ll be seeing much more of OCCM, Mike, and his partners in the future. Until then, enjoy the interview! You are first and foremost a golf course architect, but you are also a talented artist. How do those two things affect or spill into one another? 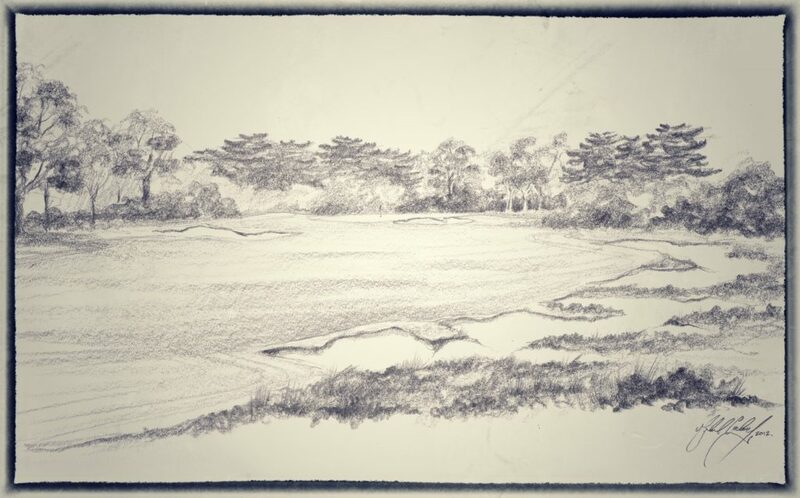 Having a good eye is an advantage when it comes to the visual side of golf course design, just as it is when doing a drawing or painting. Knowing if something looks too busy, unbalanced or out of scale can be just as useful out on site as it is at the drawing table. When able, your firm builds the courses that you guys design. Do you view the shaping of a golf course as an artistic process? Absolutely. 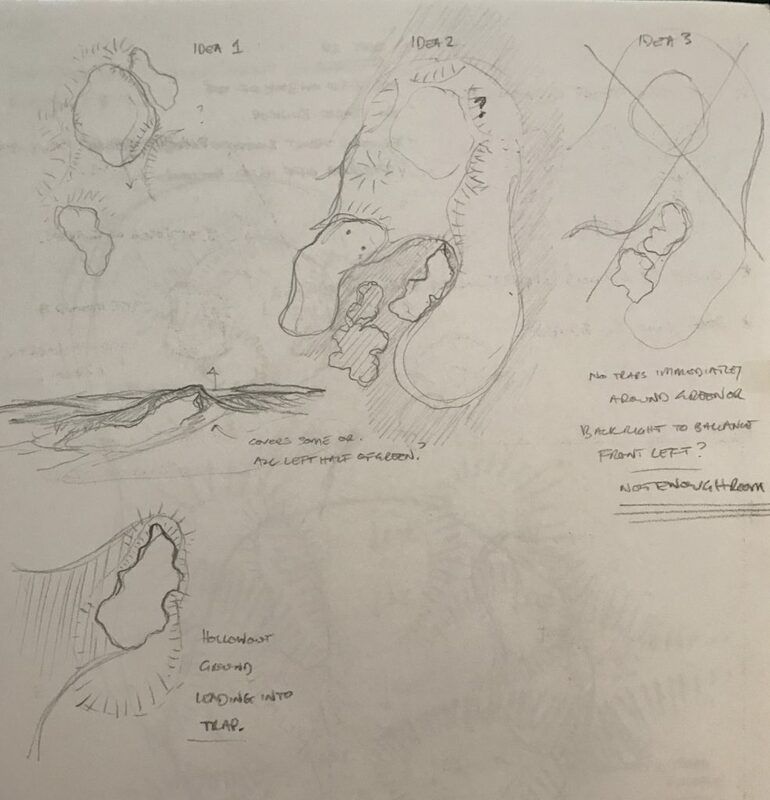 When it comes to the more sculptural elements such as building bunkers, greens or even tees for that matter, it’s an artistic process that’s hard to put into a plan or explain to others. So we prefer to limit the design work to a concept rather than detailing every hump or hollow, and then spend more time in the field refining the ideas as they evolve and come out of the ground. We approach construction this way for a few reasons. 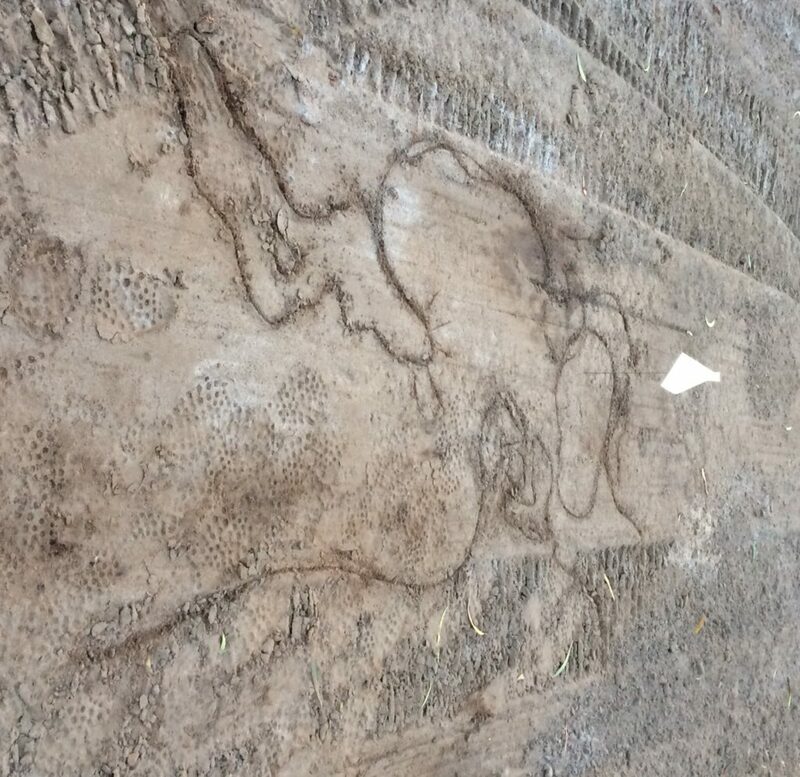 Firstly, no-one is good enough to be able to tell exactly what a highly detailed drawing will look like on the ground. You might have a rough idea but invariably it will need adjustments to make it fit the landscape and to ensure it plays and looks as you hoped it would. So in my mind it’s a waste of the clients money and time doing an excessive amount of detail if at the end of the day you are going to be there making adjustments anyway. This approach isn’t unique by any stretch but it still amazes me how many projects go the other way, where the designer makes very few visits and relies on the plans being perfect and the GPS or site foreman having the skills to interpret exactly what they were thinking when detailing the work at the computer screen or drafting table. The design-construct process is fluid and so you need to be able to make changes and respond to them in the field. Sometimes you can sketch a concept, sure that it is the very best design for the hole you’ve ever imagined. But then you start moving dirt and, oh, that bunker looks a bit big. Maybe it should be split in two. Or maybe the green should bump left or be raised at the back a little? And then there are the practical elements to work through….access, wear, drainage and so on. Then occasionally you might also need to call a halt to shaping because something starts to look really good that you hadn’t expected. Perhaps its not what you’d originally set out to achieve but it creates a fork in the road moment – scrap it and continue as planned or take advantage of it and go off in a slightly different direction? It can often work out better but if you’re not there it becomes an opportunity missed. Tell us about the collaborative elements of OCCM and the joys and frustrations of working with three other architects. I think it all comes down to personalities. If you had 4 big personalities each wanting to push their own agenda it would be a nightmare. But we know each other well, we each have some different strengths and backgrounds which I think everyone respects and we also have different roles when it comes to the design and build process so its not like we’re in each others pockets 24-7. Typically all four of us will get involved in the early stages of planning and pitching for a new project. It’s during this phase where the process is at its most collaborative – throwing various ideas at one another and seeing what everyone else thinks. Then as we go forward and get into more design development and construction one of us will lead the project – typically myself or Ashley. At the end of the day someone needs to make the call on the ground and its also best if the client is just hearing the one voice. It gets way too messy if the client is hearing from 4 different people. Of course every project is different, as is the collaborative process. Sometimes the lead architect will do the bulk of the design work, other times it might be a couple of us working closely together, but we always try and visit each others projects even when not heavily involved. In terms of frustrations? Well, occasionally you lose an argument when you really felt it was a good idea but it’s rare. A) because if you can put a strong enough case forward the others will tend to agree and B) because we all think similarly you generally know what everyone will think before putting the idea forward. Typically though our approach has more positives than negatives. Collectively we have a lot of experience with each of us having their own unique strengths so I’d like to think the collaborative approach means the chances of a ‘miss’ are reduced. Which in this business means a lot…. 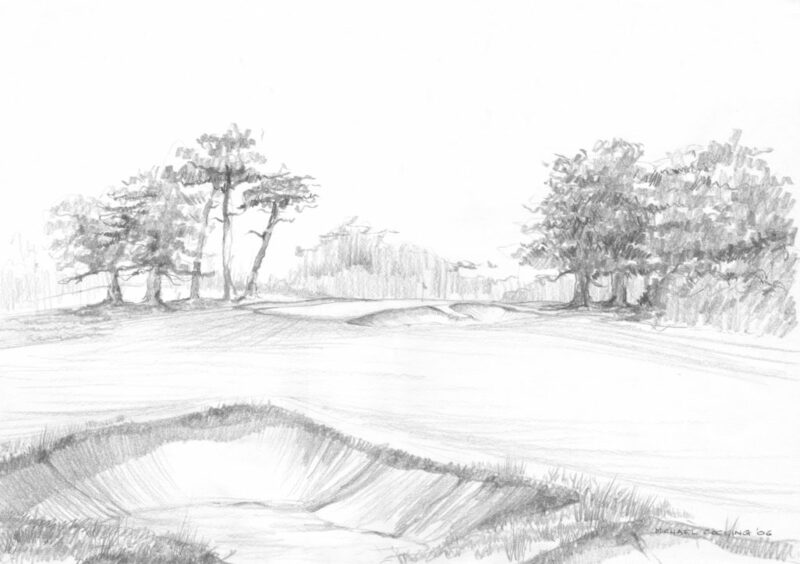 How often do you use your artistic skills for hole sketches, routings, or plans before the construction process begins? It really depends on the project. As much as we’d love to have hand drawn concepts for everything we’re working on (none of us are exactly fans of CAD style plans) its not always practical and unfortunately I just don’t have the time. Also given the nature of concepts or routings changing through the design process it gets a little tricky – there’s no such things as an eraser if you’ve painted in watercolours! If we’re pitching for a job I’ll sometimes do a drawing as it is a point of difference over our competitors and it better captures the feel of our courses than any computer plan can. Years ago when I started in design I would do a bit more drawing of concepts and so often these would form part of what we would put on display for the members to look at. These days we also do a few photo simulations for clients which are really effective… sometimes too effective as people tend to take them more literally than say a sketch which has a little more room to move. If a concept changes drastically through construction the club will often want to update the members or committee so occasionally I’ll draw the revised hole. Its quicker and again I think we prefer the style over the clinical style that a computer tends to produce. In terms of in the field……it just depends on the project and the hole in question. At Healesville I went overboard. It was my first project that I was the lead designer on. 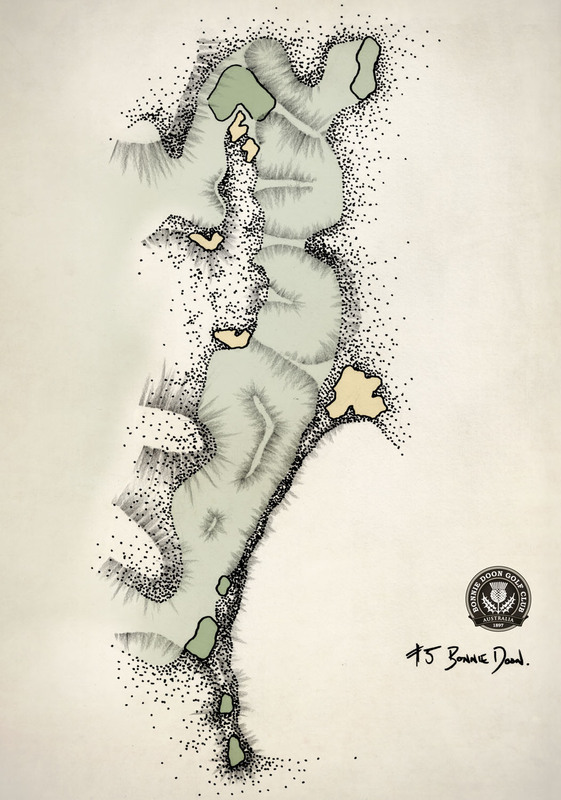 I was 26 or 27 and filled a book with ideas for bunker shapes, greens designs and the like and was paranoid about trying to create as much variety as possible so I would tend to draw the ideas in the book. Also many members of the crew we used had never worked on a golf course before so I used every means possible to try and convey my ideas. These days as we build our own work and have guys with the experience of Jason (McCarthy) the need for sketching is probably less and less. I still keep a sketch book with me, just to note down ideas, but more often than not it might be as simple as a little sketch in the dirt (e.g. 12th PK) or perhaps a little 3D sand model as we did on a few holes in Perth at Yanchep. These are perhaps the best method of all as you can draw the shape of the hole or green but then work in 3 dimensions to show contour. 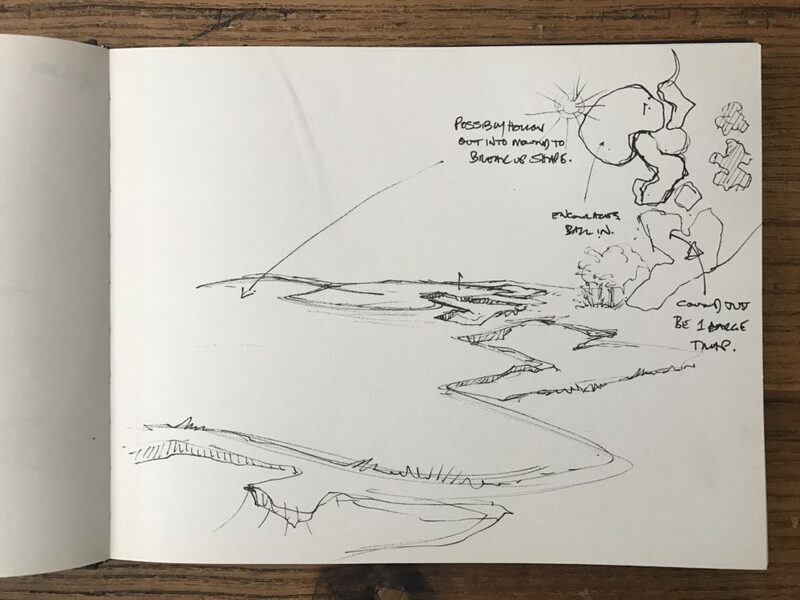 Sometimes though if the ground isn’t obviously showing one thing or another and I have an idea in my head that I’m trying to explain I might do a sketch – not for the client but just for us to talk through. It doesn’t need to be a work of art – just accurate and to scale like the example taken from earlier this week at Peninsula Kingswood (16th North). I thoroughly enjoyed gaining insight into Mike’s design process and the unique collaborative work style at OCCM Golf. Mike Cocking was extremely generous with his time compiling these images and answering all of my questions. He actually sent more of his work than I was able to put in the post! 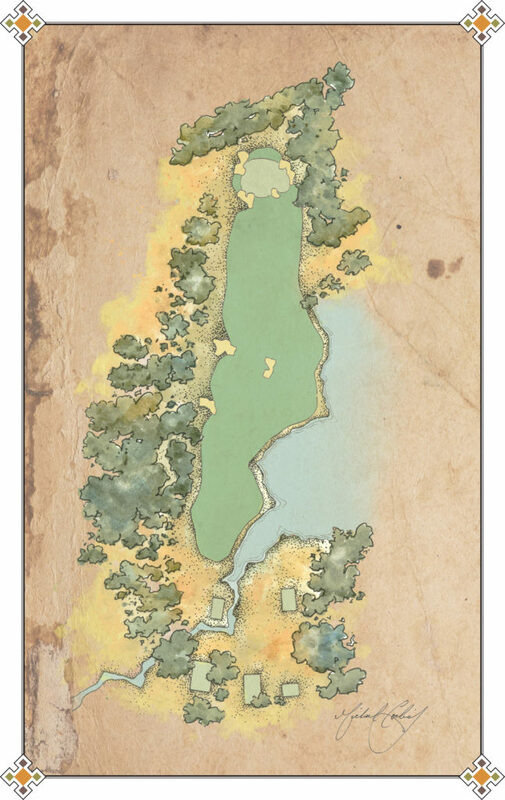 I highly suggest you look through his taste of the yardage book for Royal Queensland Golf Club and his sample of the Cape Wickham yardage book as well. Thank you to Mike and best of luck to everyone at OCCM!